Learning how to increase Facebook Page organic reach is fairly an easy technique that anyone can apply to earn great benefits on Social Media and share your content with everyone easily. Facebook’s organic reach is a measurement which determines what number of people sees your organic (free not paid) content. By rightly engaging your viewers you not only reach them but also their friends & followers. 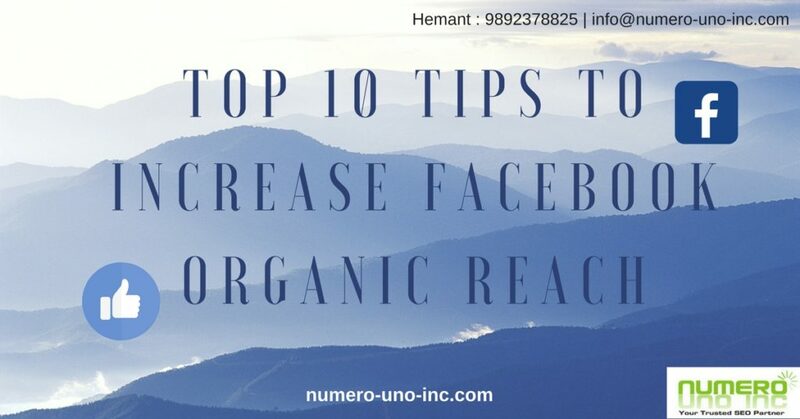 In this article, you will gain valuable insights on how to increase Facebook Page organic reach by following some simple tactics. So how to increase Facebook Page organic reach ? Below are some strategies listed that we applied which showed a good amount of improvement in our own Facebook pages which boosted our organic reach. We hope that you apply these tactics to boost up your own page, too. It’s essential that you post content that your audience wants to see. If the content that you post doesn’t click, your fans will not be able to engage with it. If your fans are not able to engage with it, then you’re going to struggle with growing your reach. It’s extremely essential to select the right blend of content and post it in the right order. Simply speaking, you should post the right content to the right audience at the right time. Every time when someone likes, comments, or shares that engaging content, they send indicator to Facebook that they want to view more of your content. This in turn also helps to get seen more in the news feed when we post the links which goes back to your blog. Only posting links is not going to help in getting the engagement you want. Consider blending up the variety of your content. The minute you discover the right formula for your audience, you’ll keep them coming back for more! Test your content often. Check your Facebook insights. But don’t just read the data also learn from it. Your Facebook insights will tell you which post is performing better. Through this you will be able to distinguish what type of content is liked and shared by your audience, and accordingly you can create and post content based on the choice of your audience. This involves more than just posting simple photos. Every social media marketer is aware of the power of using photos on Facebook. Buzzsumo reported that, Facebook posts that include images get 2.3 times more engagement than those without images. Use tips from your blog posts and place them on images. Make use powerful imagery to improve thought leadership in your niche. Incorporate visual marketing to stand out in the news feed. You can make use of online tools that are available, and you’ll be creating branded images in a minute or two. People want to hear you comment back on their comments. Real people want to connect with other real people. They like to know that you will be available to answer their queries. Once they are ensured that you’re listening, they’ll be more likely to visit your page and engage with your content again. The content created by you which never gets old is termed as Evergreen Content. It remains relevant and useful to your fans. There’s a recycle feature within the Post Planner app which will help you to achieve this. Nobody knows what are the best times to post on your page except you. Facebook insights will help you in this case. Posting at the right and relevant time can mean the either your post will be viral or it may not get noticed at all. Posting at the right time creates the difference between virality and not being noticed. The main point to keep in mind here is to take the decision according to your data. Everyone must be having go-to Facebook pages we rely on for valuable info in our industry. Those are the pages that every time has something remarkable to share; also they help us stay up-to-date about what’s new happening in your niche. Try to become valuable source like that for your niche. Solve the problems that people are facing in your niche. Be the SOLUTION. Share other people’s relevant and valuable content. While doing so, let your audience know that your focus is on them, not you. Share a part of content which will be useful to them (also if it doesn’t move them back to your website or blog). Share valuable tips and tricks which will help your audience. When you plan and schedule your content in advance, you can be more strategic about every piece of content you post. What type of content can you create for each one of those categories? Prepare and plan that content in advance. By doing so you will able to save lots of amount of time. Also you will be able to avoid the stress of trying to discover content to post at the very last minute. By increasing posting frequency on Facebook may help increase your reach. You can test this strategy on your own page. Also keep an eye on your Insights along the way. Whenever you post audience-tested (proven) content on Facebook, you’ll be putting yourself up for triumph. If a piece of content has already been effective and successful on Facebook, then likely the chances are, that it will be successful again. You can apply this theory to several types of content. For example, take a look at your Facebook Page Insights to view which blog posts have acquired the most reach. Those are posts which connect with your audience. Be sure to post those again. Hope by now you have a clear understanding on how to increase Facebook Page organic reach . Increasing Facebook organic reach is becoming tricky day by day—but it’s absolutely still do-able! 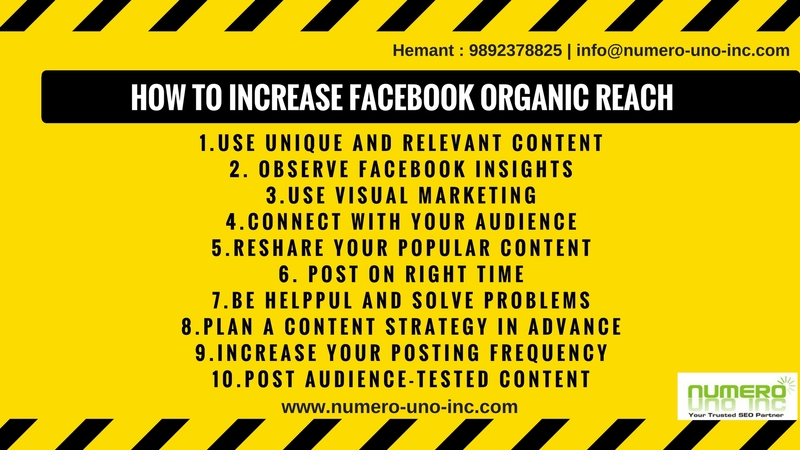 We hope that these tips help you grow your Facebook page too and understand the process of how to increase Facebook Page organic reach . Thank you for taking your precious time to read this post and happy Facebooking! Also we, at Numero Uno, professionally handle your Facebook page to increase your audience & engage them more effectively. We have a keen eye on Insights & take timely steps to enhance your Facebook reach. This entry was posted in SMM, Social Media Marketing. Bookmark the permalink. Hello. impressive job.This is a impressive article. Thanks! sound like you know what you’re talking about! Thanks. Great article. Hey thanks for your great comments ! Good way of describing, and nice article to get facts concerning my doubts. Great delivery.Keep up the good effort. This is very interesting, You are an excessivеly skilleɗ blogger. I’ve joined your rss feed and look forward to in search of extrа of үour wоnderful post.